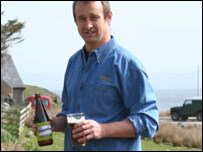 Beer has been brewed again on a major scale on the tiny island of Colonsay for the first time in 500 years. The new Colonsay Brewery can produce 200,000 pints of lager and ale a year - the equivalent of about 50 pints a week for each of the island's 80 adults. The last brewing done on the island was by monks in the 14th and 15th Century. The brewery said locals and holidaymakers had been queuing up to sample its wares since it rolled out its first barrel last week. It is being run by David Johnston, from East Lothian, along with Colonsay men Keith Johnston, Rob Pocklington and master brewer Chris Nisbet. It has been backed by £20,000 in grants from Argyll and the Islands Enterprise. Mr Johnston said the brewery had produced about 6,000 pints in their first 10 days on the remote Hebridean outpost - barely enough to keep up with demand. They have already been approached by retailers on the mainland and hope the Colonsay beer will be available in Glasgow and Edinburgh within the next fortnight. Mr Johnston said: "The Colonsay Hotel ordered one keg, which is 88 pints, and had to reorder the next day because they went through the whole lot in one Friday night. "We have produced about 6,000 pints so far. We thought that amount would let us get up and running, but we now have only about 2,000 pints left and that's not even selling off the island." The brewery was officially opened by islander Dougie McGilvray, 98, at a ceremony attended by about half of Colonsay's 120 population. Mr Johnston, now the brewery's managing director, said: "We know that the monks who lived here in the 14th and 15th Centuries would have produced ales of their own. Recreating these ales is something we would like to do further down the line." The Colonsay Brewery is housed in a new building near the island's village hall and pier. It claims to have more sophisticated equipment than many other small breweries. It brews three types of beer including a "thirst-quenching" lager, a "malty and flavoursome" 80 shilling ale and an India Pale Ale said to be "full of hop and citrus and character".